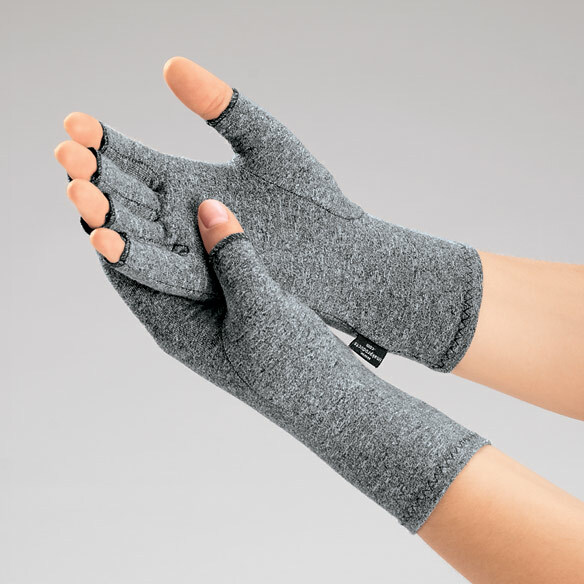 Breathable cotton Lycra® compression gloves for arthritis provide mild compression that keeps hands warm, helps increase circulation and promotes healing. 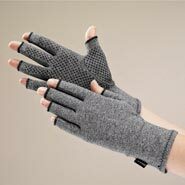 Arthritis glove's open-fingertip design allows full freedom for daily activities. Washable, latex-free. Imported. Severe pain in fingers and hand due to arthritis. My husband loves these gloves. My husband uses them at night when pain is heavier. He's noticed that he also has less off and on pain during the day. I purchased these gloves for my daughter, who had rec'd 3rd degree burns in October on her hand. The 1st glove that was made for her to wear was too small, the 2nd one, she was still having trouble with. She said, "these gloves feel so much better and she's like them very much and is wearing every day. I have both types of arthritis and mos of the time my thumb joint, both of them, just hurt terribly. These gloves put just enough pressure and compression to alleviate the pain. They are fantastic. I use the product when driving, after a day of typing and at night when I sleep. Within five minutes the pain is usually gone. On the days I forget the glove at home a immediately put them on when i get home and because they make my hands feel so good I sometimes sleep with them on. I even bought a pair for my sister who does prep work in a kitchen and she loves them. Happy hands = a happy life. Using at work for computer key board entry. These gloves are great for computer and microscope work in an airconditioned building where my hands would normally ache from the cold. They are NOT cumbersome. I also used these gloves during 38.5 hours plane travel - no swollen hands! The gloves was a gift. Hy frind complaned all the time about his hands so I got the gloves for him and I have not heard another peep out of him about his hands. One hand is colder than the other and suffers from athritis more. It is this hand I wear the glove most often. They were nice and soft and comfortable to the skin. Some people said the seams were rough, mine were fine. I would use mine for typing when my fingers get so cold and go numb. The warmth would help them from going numb. This was a gift for a friend that reports that it does indeed provide her comfort at night. I like these gloves....but, I have to wear them inside out, because the seams are hurtfull. Also, when I washed them, the sewed part threads are coming apart. and....I wear gloves most of the time and I find these too pricey to have multiple pairs. But... 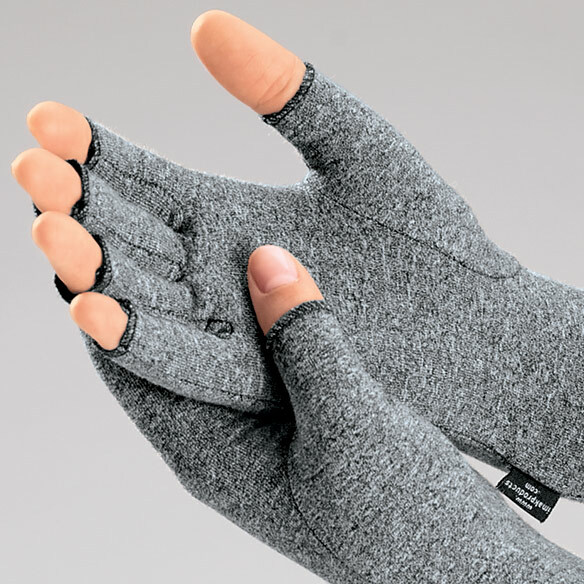 The compression is wonderful and they keep my hands warm, so I only wear them to sleep. I don't use these they are too tight. I measured per your directions.. I wear a size 8 women's glove and purchased both medium and large gloves to try. right away the stitching on the end of the fingers was sticking out looking frayed and just plain messy in appearance. the fingers were too long and the body of the gloves even on the large size was way too tight. had to take them off in less than an hour and i haven't had to courage to try again. my hands are only slightly swollen due to arthritis in my wrist. worst buy in along time. must return them on pay day. these are bad news for anyone!!!!! These are wonderful for arthritic hands! have these already and am pleased with them. I first purchased these a couple years ago because of my arthritic hands. These are the very best I have found. I have purchased a couple pair as gifts for friends and have referred these to several others. My partner uses them. She says they help her a lot. She should know, she does a lot of yard work! I need to keep my hands open when I sleep at night because I have a contracting problem that could get worse. Dupytrens disease. my husband needs something for his hands. Help my pain at night. I have a pair of these and have used them so much the fingers, even though open have holes in them. you can put cream or ointment on them the gloves before going to bed and you don't get the sheets greasy. the are very comfortable. I have worn a pair of these every night for about 3 years and they work wonderfully. I would recommend them highly. I HAVE PAIN IN ONE OF MY THUMBS. My hands get cold, but I need to be able to use my fingers. My wife said she needs them. Have used in past and seem to help hands in support and movement. They helped a lot with pain and warmth. I have used these gloves for several years. They work great. What kind of glove gives support to both fingers and wrist? BEST ANSWER: Thank you for your question. They are recommended if mild to moderate levels of compression are required.We hope this information will be of help to you. BEST ANSWER: The Lycra compression gloves are good and do work good for me. but I haven't slept wearing them all night, so can't answer that. However if I were to buy another pair; I would get the ones with the ones with rubber grips. Hope this helps. I like these gloves very much, but I do not have arthritis. I use them for neuropathy, and they make my hands feel much better when I have them on than when they are off. Good luck -- I hope you like them as much as I do. I bought these for my Mom, she did not like them. 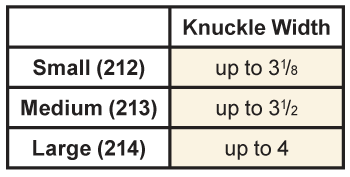 how do you measure knuckle width? BEST ANSWER: Thank you for your question. To measure your hands for the glove sizing if you place your hand flat on a table with your fingers touching and use a ruler to measure the across your hands at the knuckles you will then be able to correlate that to the size you should order. We hope this information will be of help to you. What percentage of Lycra is this glove? BEST ANSWER: Thank you for your question. Unfortunately no this is not adjustable. We hope this information will be of help to you. No. The material stretches. These gloves really help my hands. If you measure between 3 1/8th and 3 1/2 (actually measure 3 1/4th), which size should be ordered? Thank you for your help. Will be placing an order now that I know what size. are therapeutic support goves washable?